Amid reservations from the fringe parties, the government on Thursday presented the bills related to elections for Federal Parliament and Provincial Assemblies, imposing a 1.5 to 3 percent threshold for the parties to be eligible for representation in the House. Minister for Home Affairs Janardan Sharma tabled the bill on Election of Members of House of Representatives Act with a provision that any party failing to win at least one position under the first-past-the-post (FPTP) system and not securing a minimum three percent votes under proportional representation will not get proportional representation seats. Any party winning seats in the FPTP that fails to secure 3 percent votes will get representation as a party of independents. The provision was included in the bill in line with the Political Party Act endorsed by the House on March 22. Minister Sharma also tabled the bill on the Election of Members of Provincial Assemblies with a provision of 1.5 percent threshold for proportional representation. Only the parties winning at least one seat in direct election and garnering 1.5 percent proportional votes will be recognised. Parties failing to get 1.5 percent votes but winning FPTP seats will be take seats in the provincial assembly as a force of independent members. “These provisions are against the spirit of democracy and motivated by the Panchayati sentiment,” Nepal Majdoor Kisan Party (NMKP) lawmaker Dilli Prasad Kafle told the House, referring to the partyless era. 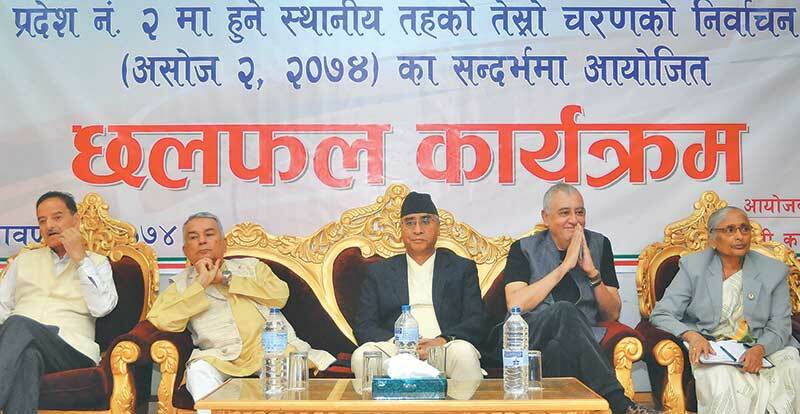 He claimed that the provision contradicts Article 269 of the Constitution of Nepal. The NMKP had registered a notice in the Legislature-Parliament against presentation of bills without revising the provisions. The protest, however, was rejected as four major parties Nepali Congress, CPN-UML, CPN (Maoist Centre) and the Rastriya Prajatantra Party support the threshold. “There is nothing new in the bill. The threshold provision is included in line with the Political Parties Act already endorsed by the House,” said Minister Sharma, defending the provision. The House will have clause-wise discussion on the bills before tabling them for endorsement. Both the Acts are necessary for holding the federal and provincial parliamentary polls before January 21 next year.